In honor of the late Dave Arneson, who left us one year ago today, I present my (non-winning) entry in last year’s One Page Dungeon Contest. I was gunning for the “old school” category and took my inspiration almost 100% from Supplement II: Blackmoor. So in case you missed it (and you know you did) here’s your chance to visit . In ancient days the monastic assassins known as the Sons of Arn built a great temple to their strange god on an island off the southern coast. For many years they managed a troubled coexistence with the other religions. But when they dared to strike down the high priest of the sea god, their island temple was cast beneath the waves forever in an act of divine retribution. Their knowledge lost and their religion destroyed, the Sons of Arn vanished from the world, leaving only half-remembered whispers in their stead. But now rumors abound of a shipwreck whose lone survivor escaped from a Sahuagin band that makes its home in a submerged ruin eerily reminiscent of the legendary Sunken Temple of Arn. As a One Page Dungeon, The Sunken Temple Of Arn lacks game stats, but should be useable with pretty much any system you want. I specifically had OD&D in mind when I wrote it (obviously), but Swords & Wizardry (Core or WhiteBox) or Labyrinth Lord should work fine. Of course, so would Barbarians of Lemuria, Basic RolePlaying, OSRIC, or any other system that tickles your fancy. Most people who happen across this post probably know that stuff already. But hey, it never hurts to pass along a bit of (slightly) lost wisdom, eh? This entry was posted in Labyrinth Lord, Maps, Swords & Wizardry, WhiteBox on April 7, 2010 by the venomous pao. And welcome to Strange Stones! 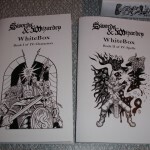 It seems that my pictures of the just arrived Swords & Wizardry WhiteBox Boxed Set have turned out to be pretty popular. So welcome to all you new visitors (and old friends, too) who’ve stopped by. I don’t have any new content today – I’m far too hungover from a night of EuroRails in which I lost the game but won the “Who gets to polish off this bottle of ’91 Glenrothes?” contest – but I thought for the sake of the new visitors I’d point out my main project on the blog right now, The Demons Of Adad Untash. This project will wind up consisting of a whole passel of demonic baddies for use with Labyrinth Lord & the LL Advanced Edition Companion (though, clearly, they’re usable with a whole bunch of other games that share a certain DNA, including S&W). I’ve just recently completed the lower order demons and the standard order beasties are up next. They should start rolling out a little later this week. Meanwhile, here’s one more picture of the WhiteBox, alongside its grandfather and its cousin. This entry was posted in Labyrinth Lord, Swords & Wizardry, WhiteBox on February 28, 2010 by the venomous pao. 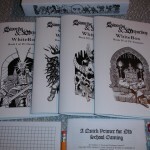 The S&W WhiteBox Boxed Set Has Landed! Guess what just got delivered to me by my friendly neighborhood mailman? 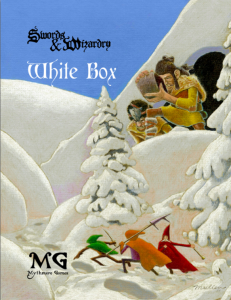 That’s right, kids, it’s Swords & Wizardry WhiteBox Boxed Set time! I love it. It reminds me of my OCE box when it was new. The 3×5 character sheets that were listed in the initial offering don’t seem to be in here. Packing error or change in plans? This is slightly disheartening, but not tragic. The dice are pretty crappy, all things considered. 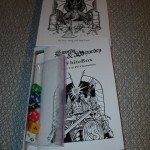 But they’re dice that came in a game box, so even though I’m a snob I love them anyway. 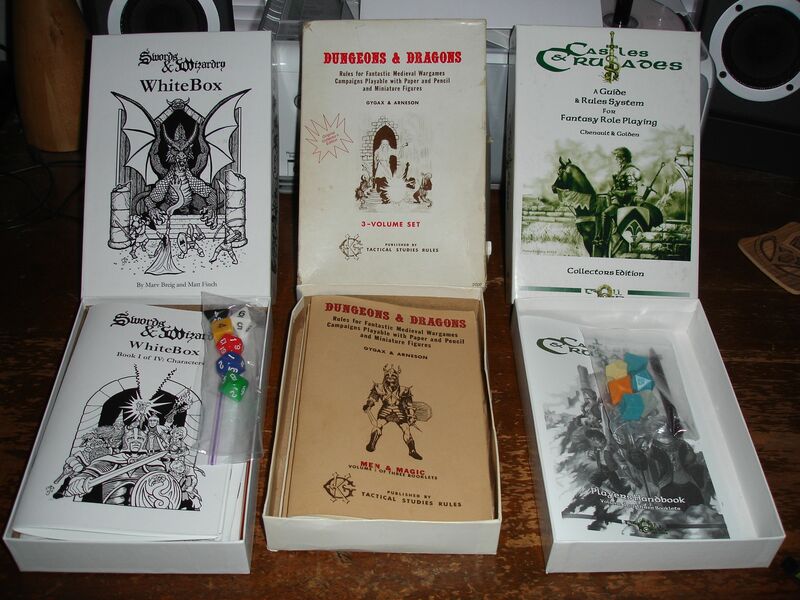 Actually, I’ll probably throw these into my big bin o’ dice and put the Gamescience dice from my Castles & Crusades Collector’s Edition boxed set in here, since I’m not really a C&C fan anymore. The box contains a flyer pimping TARGA and Chgowiz’s Reference Sheets, which I think I’ll take advantage of shortly. 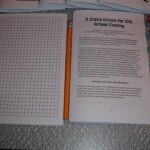 The digest-sized graph paper pad will have me drawing dungeons within the hour. Or else I’ll refuse to sully it and it will still be pristine 30 years from now. Either way, score! 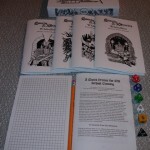 Mythmere’s A Quick Primer for Old School Gaming was born to be made digest-sized. It actually reads better at this size. Weird. The books look sharp and feel “new.” It’s lovely. Oh. My. God. 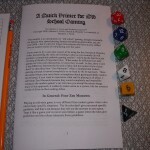 Book II of IV: Spells and Book III of IV: Monsters both have blank templates at the back for you to fill in your own creations. These books are begging to be written in. Can I actually do it? Time will tell. In summary, I’m damn glad I bought this little package when I did. I just wish that the box-maker hadn’t screwed over Brave Halfling as much as they did, because the delay in receiving this little gem gave Labyrinth Lord, by way of the Advanced Edition Companion, the time and power to devour my brain. Still, it’s not like these wonderful games can’t each get some of my time, and there’s no doubt that they will. If only I didn’t have to have a day job! 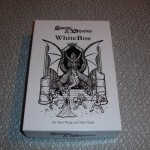 This entry was posted in Swords & Wizardry, WhiteBox on February 27, 2010 by the venomous pao.